April 25, 2016 / Agatha B. 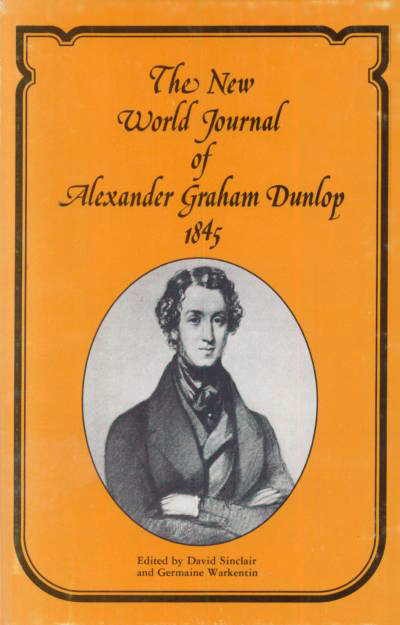 The New World Journal of Alexander Graham Dunlop, 1845, edited by David Sinclair and Germaine Warkentin. Published by Dundurn Press, 1976. David Sinclair (born in Toronto in 1942) was a bibliographer, scholar, and librarian who was employed at E.J. Pratt Library, Victoria College (University of Toronto) between 1968 and 1973. He joined the library staff when Lorna Fraser, the chief librarian, appointed him to the position of a rare book and special collections librarian, to catalogue the library’s manuscript and rare books collections, and to make them accessible for consultation by scholars and other researchers. Sinclair’s comparatively short but accomplished career in academic librarianship exemplified the increasing importance of subject specialization of librarians to the institutional prestige of university libraries. His scholarly contributions to the library and Victoria College represent the type of academic professionalism that is evident in the work of many university librarians. Sinclair held a Bachelor of Library Science (a professional degree), as well as a Master of Arts degree in English literature (his graduate dissertation was a study of ). In addition to his daily responsibilities in the bibliographical services department of the library, which involved cataloging rare books and creating detailed finding aids for special collections, Sinclair also researched and published extensively, and taught several upper-year undergraduate courses at the College on Canadian literature. He was also the first Bibliographical Fellow of the Cenre for Renaissance and Reformation Studies and was responsible for organizing the Cenre’s rare books collection. A notable exception was David Sinclair... A brief comment in his introduction, as well as his notes on each text, provide a sense of Sinclair’s editorial effort. In his notes, the editor offered information about variant versions, indicated the source texts he had selected, and provided a rationale for emendations and corrections that were made to them. Influenced by the touchstone “authorial intention” that animated the textual practices of his say, Sinclair sought out versions of the poems that were published during the author’s lifetimes. In 1972, he requested a leave and absence and relocated to London, England and begun postgraduate work in bibliography at the University of London. Sinclair died unexpectedly following a street accident in London. His manuscripts, photographs, and correspondence are gathered in the David Sinclair special collection.